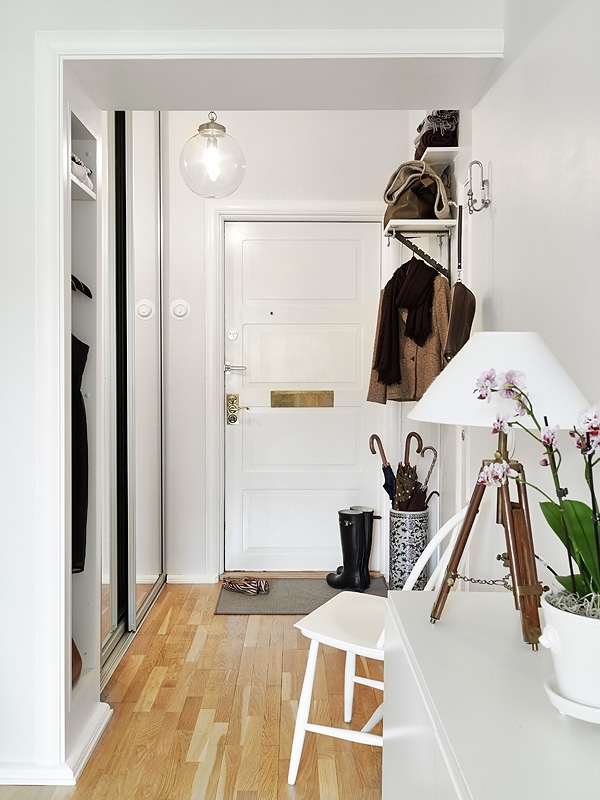 This small white apartment boasts comfort and style in a small but comprehensive package. It has everything that one could want conveniently wrapped up in one inviting living space. Wood floors run throughout all the rooms with the exception of the bathroom, generating the atmosphere of a naturally cozy but stylish home environment. 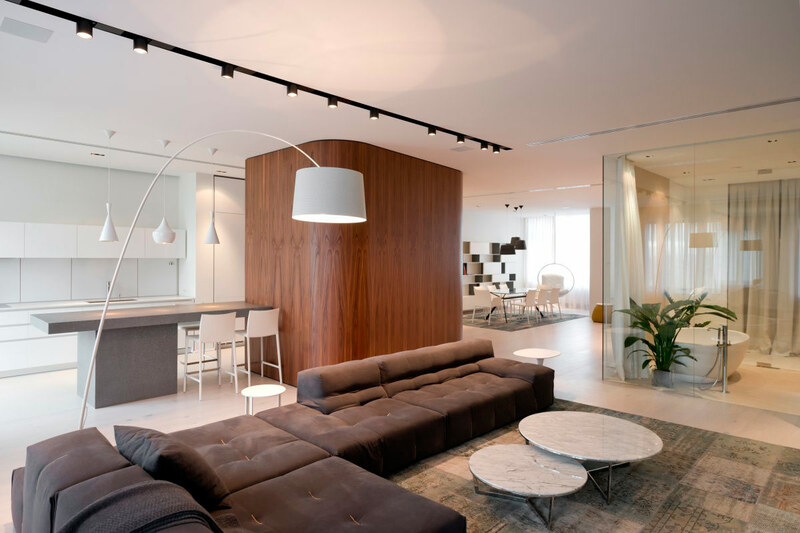 The predominantly white décor adds an air of class and enhances the natural lighting facilitated by the building’s design. The white themed living area is well illuminated with natural light let in by the triple panel windows. The unique book stand that adorns the wall next the window is accentuated by a mobile lamp. Two beautiful earth-themed lamps, one hanging just above the sofa and the other standing atop the white multi-drawer serve the dual purpose of enhancing the natural look while providing lighting options. 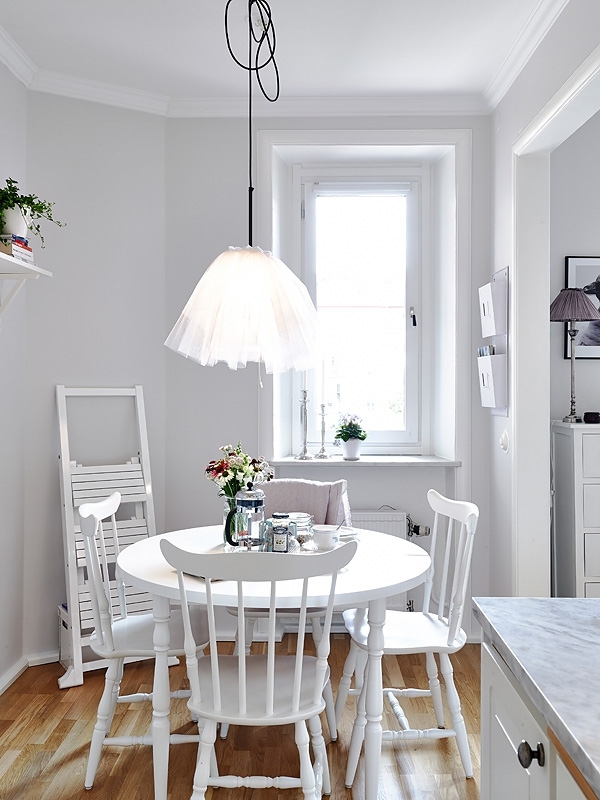 Sandwiched between the living are and the kitchen is a small but comfortable eating area that adds to the intimate feeling created by this attractive small white apartment. Above the white dining table is a low hanging chandelier, which functions as not only a source of light but also a reminder that this lovely unit is a haven of style. 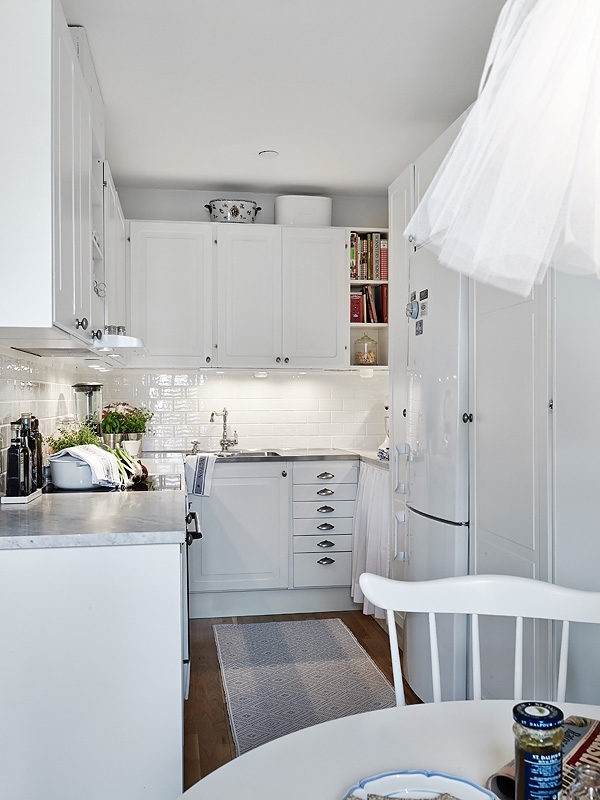 The white-themed kitchen is inviting and exudes an aura of cleanliness. 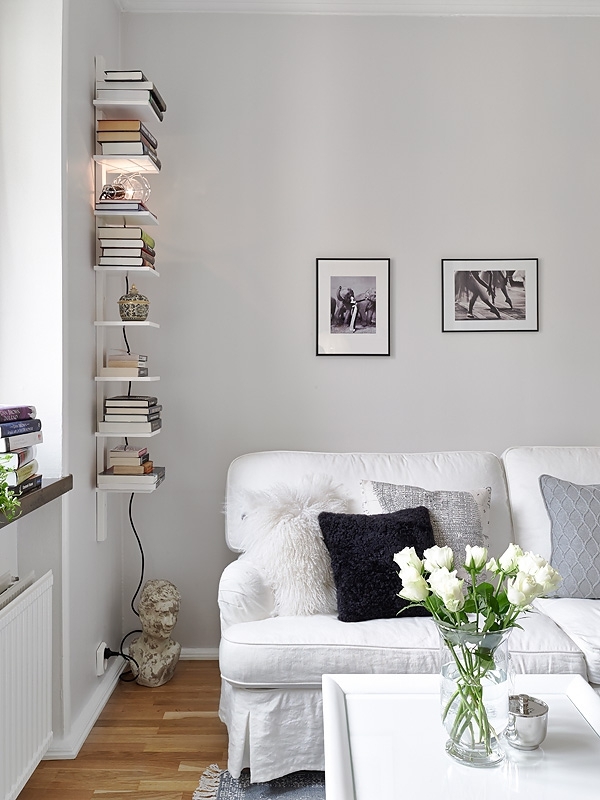 The splashes of green embodied in the decorative plants help to tie in the natural elements of the general décor of this attractive small white apartment. Serenity, relaxation and sheer splendour are among the emotions that can be expected from a stint in the bedroom area of this lovely home. It’s located in a corner of the living area, but still provides comfort. The fabric used for the bedding blend in well with the color trend of the entire apartment. The checkered white and black tile flooring in the bathroom is practical for such a room but class is not sacrificed in the process. 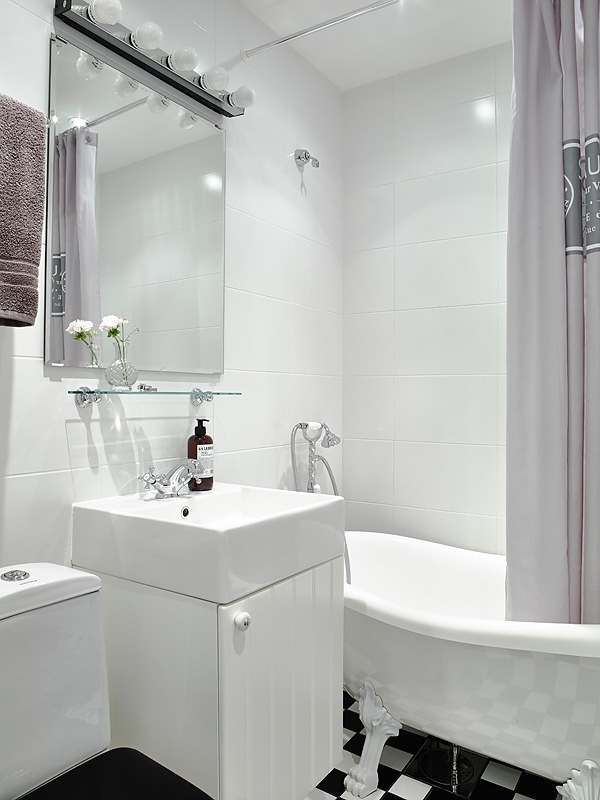 The white Victorian style tub engulfed in the white walls and fixtures helps to establish the classiness of this bathroom. 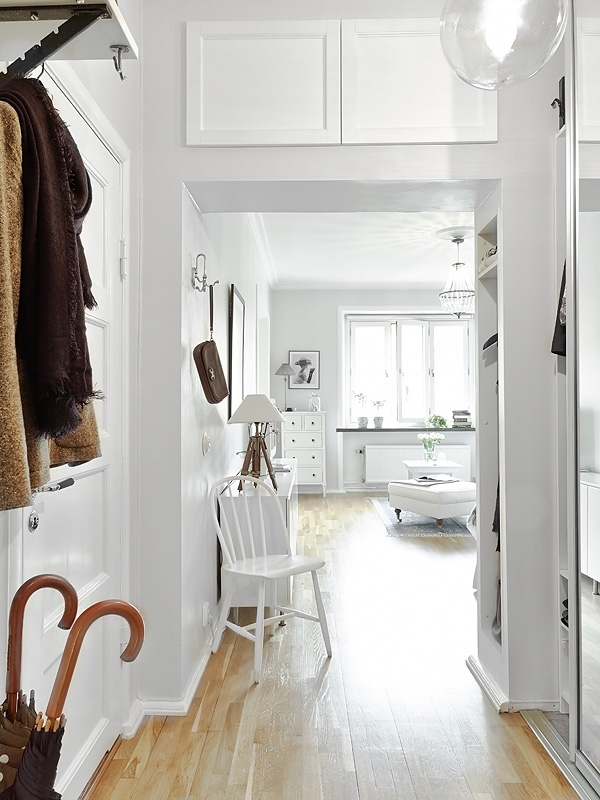 This small white apartment is a dreamy retreat that is ideal for almost any young couple or single person.